Long before Spielberg and Lucas turned archaeology into big screen adventures that enthralled us all, Hollywood flirted with the subject on numerous occasions beyond the Universal Mummy series of terrors. 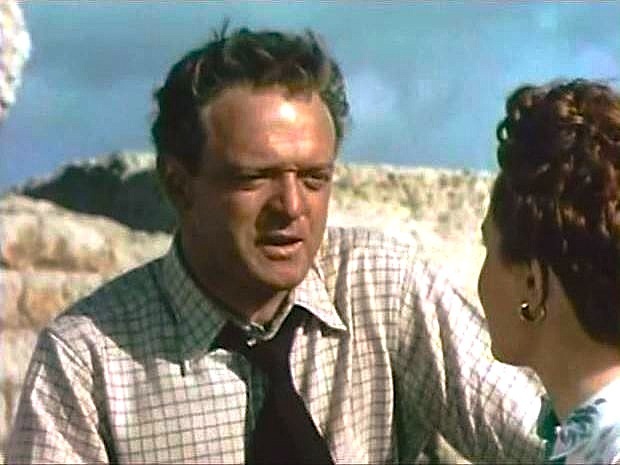 For this journey across deserts and underground catacombs, leading man Van Heflin at the age of 45 ventures overseas to the Roman ruins in Algeria where he’ll meet and possibly find romance with his 25 year old costar, Wanda Hendrix. Possibly? Who am I kidding. This proved to be another British production that allowed one of Hollywood’s well known names to travel abroad and make movies. In this case it’s Heflin who joined the likes of Mitchum, Ladd and Peck among others who received star billing while the majority of the actors in the film were homegrown. 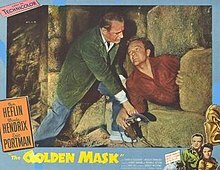 For The Golden Mask you’ll see Eric Portman of England, Jacques Francois of Paris and George Pastell of Cyprus joining in the treasure hunt. 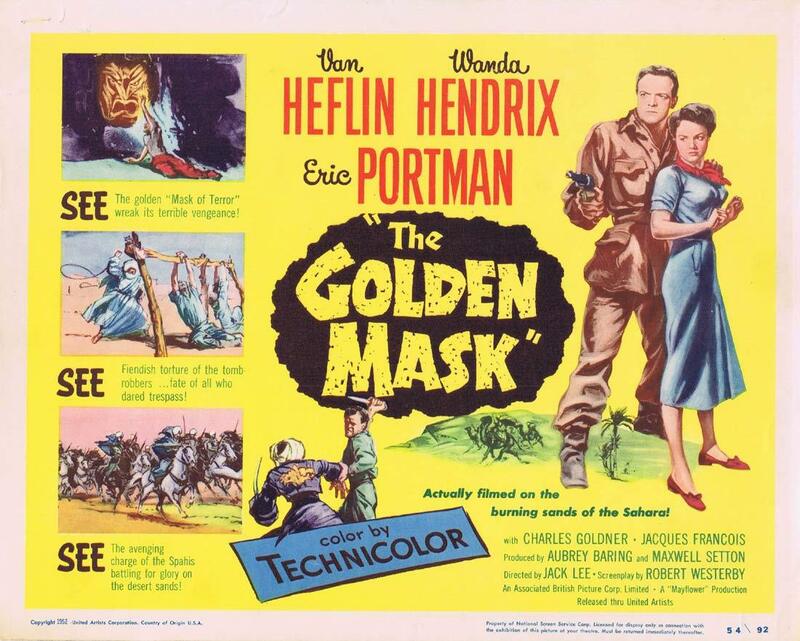 Heflin volunteers to join the long brewing expedition led by Portman and his daughter, Hendrix, to find a tomb with untold riches including a golden mask. Van is a writer/archaeologist who’s work is looked down upon but Portman needs help so agrees to allow the loud talking American to come along. Francois is also on the team and for the moment is the beau of Miss Hendrix. (If I know anything about Hollywood scripts, this guy doesn’t stand a chance) Van is going to soon learn that the group is not alone in the hunt for treasure. Another faction is a little less scrupulous in their methods of extracting information and possible locations for the treasure. 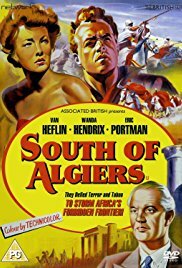 Time for some second unit footage of Algeria and according to the opening credits, there’ll be an “Oriental Dance by Samia Hakim.” Much to Heflin’s delight I might add. This is of course before he realizes the 25 year old Hendrix is looking at him with big doe like eyes. Fans of Hammer films are sure to get a charge out of seeing George Pastell turn up here at the sight of an archaeological dig. He’s there to explain to Van and Eric that it’s a sacrilege to desecrate the ancient tombs. 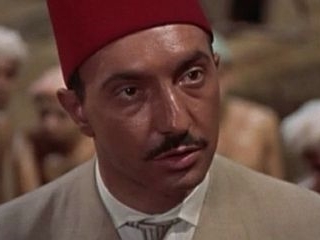 One has to wonder if Terry Fischer had seen this movie and ensured Pastell’s casting in the 1959 Hammer classic The Mummy because that’s precisely what Pastell is telling Peter Cushing in that film. This is a desert location so we’re still to see sand storms, Arabic raiders, men tortured over the hunt for gold and Van making good in the heroic department when he adopts a pair of orphans while at the same time leading the bandits away from the main party saving the lives of Portman and more importantly, Miss Hendrix. It won’t take long in an 88 minute feature film to find the golden mask within their grasp either. Can they reach it before the villains of the story and place it in a museum where it can be a marvel for all to see or will the tomb raiders melt it down to line their own pockets with millions of dollars? By no means a classic and for the most part a footnote in the career of Heflin, this one makes for a diverting entertainment for the rainy Sunday afternoon. The fact that it came out the same year as Shane pretty much buries it in the backdrop of Heflin titles. Hendrix was just coming off a marriage to Audie Murphy and would continue on in “B” titles till her career wound down in the 1960’s. 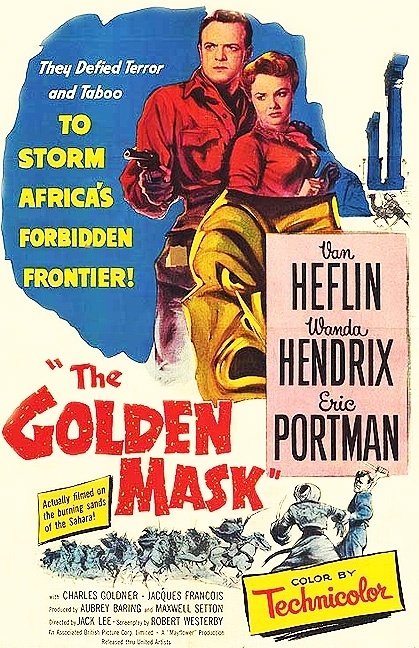 I know the film under it’s U.S. title, The Golden Mask which turned up on TCM giving me a chance to see it. The print was rough and could use some restoration though I don’t see that coming anytime soon considering it’s a lesser known effort. According to the IMDB it was released under the South of Algiers title in my own country here in Canada. Either way it’s a decent effort and for Heflin fans a chance to see him in something a bit different. Just don’t expect an early variation on Indiana Jones. For that you’ll need to check out Chuck Heston in The Secret of the Incas. Even lesser Heflin is worth a watch, though — I’ll keep an eye out for this one. Many thanks for the info! That’s pretty much what it is, “lesser Heflin” but yes I’ve always been a fan. He has a certain honesty or integrity that comes through in many of his roles that makes him likable. Always been a big Helfin fan! Loved him in Rod Serling’s Patterns with Ed Begley Sr. Yes me too. Patterns a good one. Also saw The Prowler for the first time a year or so ago and that was another impressive flick along with the usual titles like Shane and 3:10 to Yuma. 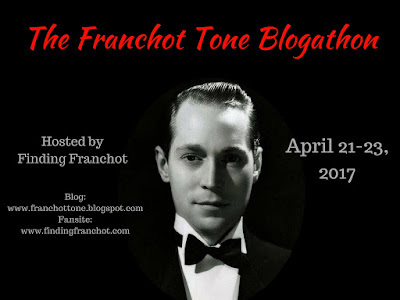 I need to see more of his 1940’s output. I have yet to see The Prowler, but will look for it for sure. Another very cool Heflin piece is something you can find on YouTube. Look for “3 O’clock” on the radio show Suspense. I was always amazed at the performances on radio. 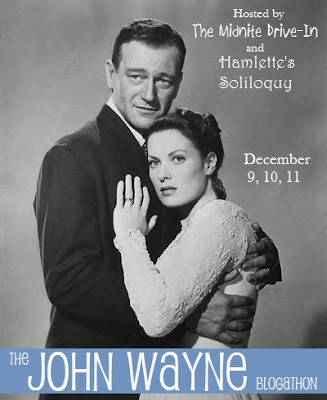 Heflin is brilliant in this show. 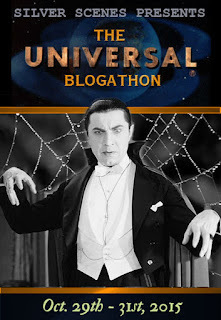 In college I used clips of Heflin from this show to illustrate the use of the imagination. It’s worth the 30 minute listen! Thanks for the tip. I’ll do a search. 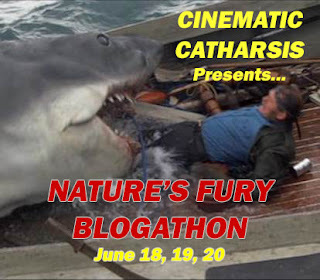 This sounds like one to check out. Will have to keep an eye out. Was only watching The Mummy a couple of days ago actually, that one is great fun too. Yes The Mummy a great example of what Hammer could do on a budget. They had such an identifiable style in those early efforts. An interesting post about Heflin. I knew little about him. I’ve always liked him. 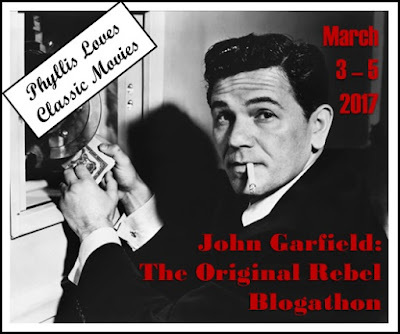 He has a Glenn Ford appeal with an edge.